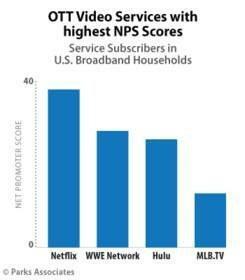 DALLAS, TX--(Marketwired - Sep 1, 2016) - Parks Associates today announced new data from the company's OTT Video Market Tracker service showing Netflix, WWE Network, and Hulu have the highest Net Promoter Scores among major OTT video services in the U.S. The international research firm notes that adoption of OTT video subscriptions has increased by 12% since Q3 2014, with the number of available services and consumer awareness both increasing, despite password sharing growing by approximately 8% over that same time. "We have seen a steady climb thus far in 2016," said Brett Sappington, Senior Director of Research, Parks Associates. "With Hulu's shift to a subscription-only approach, OTT video subscription penetration in the U.S. market will continue to rise through the end of this year." Net Promoter Score (NPS) measures the likelihood of subscribers recommending a product or service to others. Parks Associates' OTT video research shows that NPS is a good indicator of the performance of a service among consumers. Sports services, including WWE and MLB in particular, make strong connections with consumers. "Net Promoter Scores reveal the motivations behind many of the churn rates we are seeing," said Ruby-Ren Bond, Research Analyst, Parks Associates. "For example, Hulu has a higher churn rate than Amazon, but its NPS is much stronger than Amazon's. That indicates the retail side of Amazon's Prime service is likely a strong factor than the video service in retaining is subscribers." Parks Associates' OTT Video Market Tracker provides industry research data and analysis of competing players' strengths and weaknesses in the space. The service includes an exhaustive analysis of market trends and profiles of the nearly 100 OTT video service providers in the U.S. and Canada, such as Netflix, HBO, YouTube, and Amazon, with updated deliverables throughout the year.